Witches and wizards crowded into Quidditch supply shops, parents ushered their children in to Ollivander’s for a wand, and nearly everyone could be seen sporting their house colors of red, blue, green or gold down the streets of Diagon Alley. “A Celebration of Harry Potter,” which took place at Universal Orlando this weekend, brought Harry Potter fans from all over the country together to share their love of the series and all things magical. From a wand masterclass to a sit-down session with some of the movie’s stars, the weekend was the place to geek out over every carefully created detail of the Wizarding World. While nothing can rival a feast at the Great Hall, the Wizarding World featured delightful food and drinks never before seen in the muggle realm. 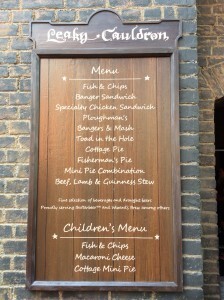 Starting with the newest dining option in the parks, the Leaky Cauldron is an excellent step up from the traditional theme park fare. Hearty English classics like bangers and mash; beef, lamb and Guinness stew; and fisherman’s pie fill the menu. 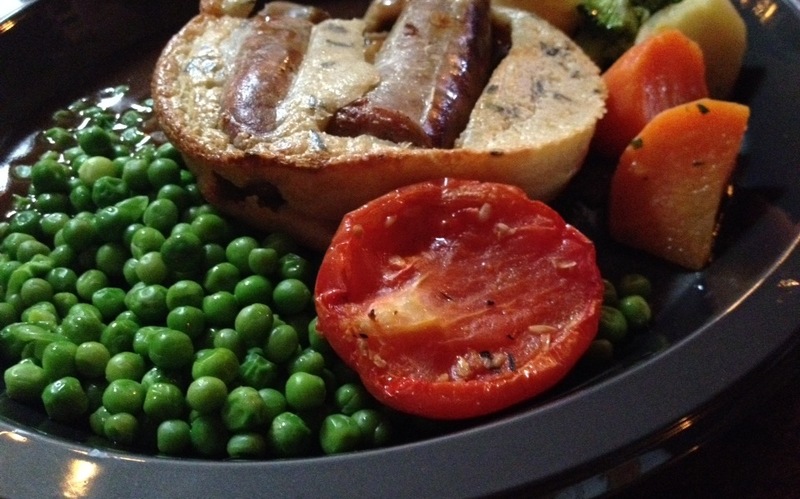 The “Toad in the Hole” seemed irresistible – an English sausage baked into Yorkshire pudding (think savory bread pudding) served with onion gravy and roasted root vegetables. And nothing can beat the Leaky Cauldron’s atmosphere: wooden rafters, stone walls, and moving portraits complete the look and feel of this British pub. Altogether, this provides a finer sit-down dining experience than Three Broomsticks, a fast-casual spot located in the Hogsmeade portion at Islands of Adventure. There, diners can order quick meals like fish and chips, rotisserie chicken and cornish pasties – the English version of an empanada. And of course, no visit to the Wizarding World would be complete without Butterbeer – the signature drink that tastes like cream soda and butterscotch swirled into a delectable brew. 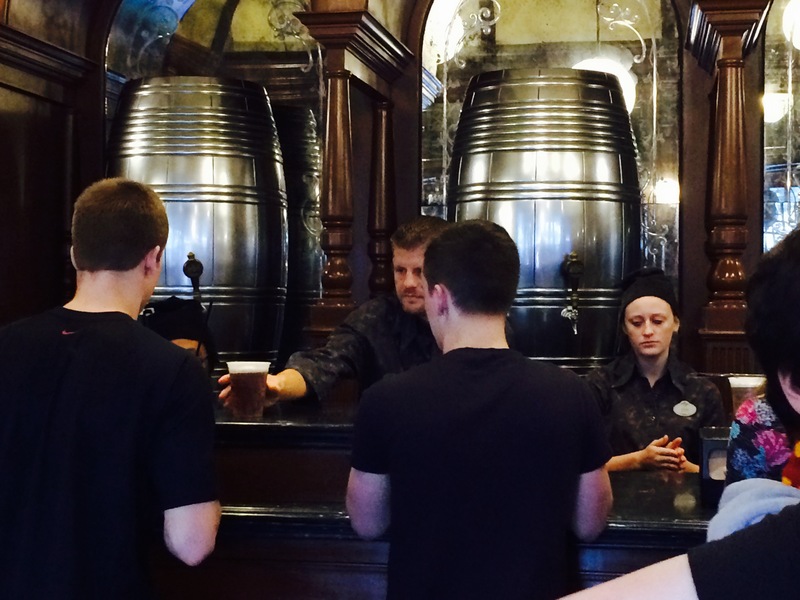 But Universal’s latest creation has one-upped Butterbeer. Word of this mythic treat has not yet reached the ears of the masses, but they’ve created Butterbeer ice cream. Butterbeer. Ice cream. Yes, the smooth and creamy taste of butterbeer has been swirled into a rich ice cream base. 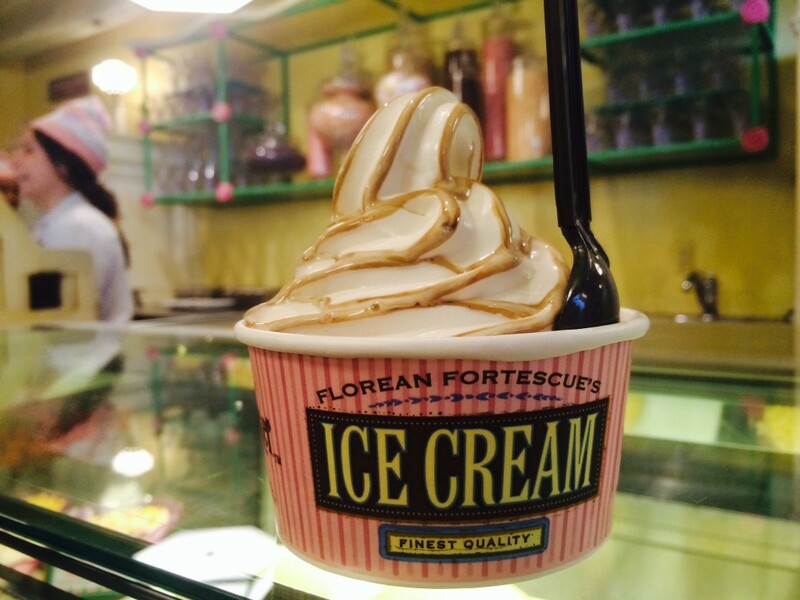 This treat is the creme de la creme of anything Florean Fortescue’s Ice Cream Parlor has to offer – and they sure have many – clotted cream, chocolate chili, earl grey and lavender, and sticky toffee pudding, to name a few. While Butterbeer is served hot, frozen and room temperature in both restaurants, don’t overlook the other available drink options: Peachtree Fizzing Tea, Tongue-tying Lemon Squash, Fishy Green Ale, and Pumpkin Fizz – which tastes just like pumpkin pie. They have also added a selection of alcoholic beverages like Wizard’s Brew, Dragon Scale and Draught Beer, which are available for over-21 wizards. Eternelle’s Elixir of Refreshment is a small kiosk set in the middle of Carkitt Market that offers several vibrantly colored potions for magical folk to savor. 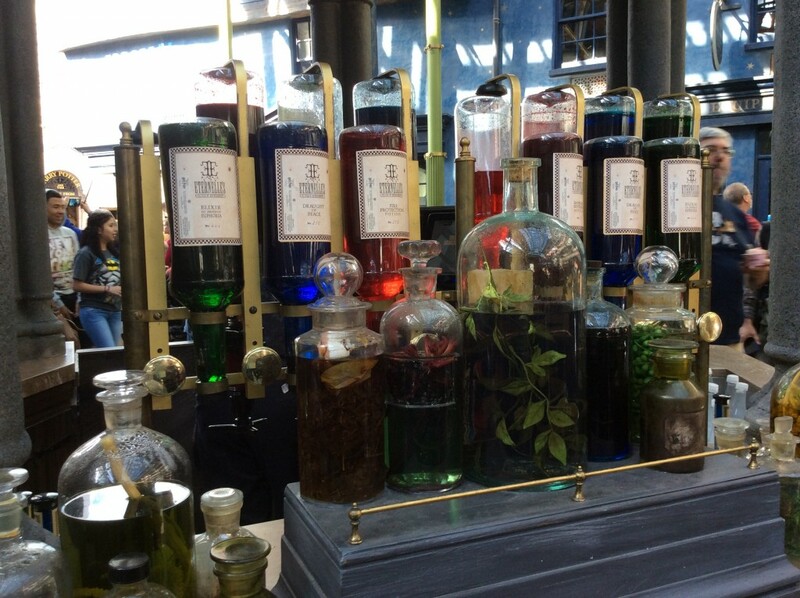 The potions, which can be described as sugary-sweet syrups in the muggle realm, can be combined with a bottle of gillywater (just cleverly packaged bottled water) or sipped alone. Eternelle’s serves up “Draught of Peace,” “Babbling Beverage” and its two most popular flavors, “Fire Protection Potion,” watermelon with hints of peach and strawberry, and “Elixir to induce Euphoria,” which is described as pineapple with notes of mint, but tastes more like banana than anything else. Visitors can also find treats outside the restaurants at spots like Weasleys’ Wizard Wheezes, a joke shop in Diagon Alley. Each treat has been carefully brought to life from the books where the vivid description must be translated into an actual treat – a daunting challenge. However, the sheer joy at having a “Skiving Snackbox” or “Bertie Bott’s Every Flavour Beans” often overshadows the actual taste. For example, the chocolate frogs are a novelty, with more effort placed into the packaging than the lackluster chocolate flavor. Yet the attention to detail extends to every inch of the park. From the carefully constructed shops to the thrilling “Harry Potter and the Escape from Gringotts” ride, everything is a marvel. 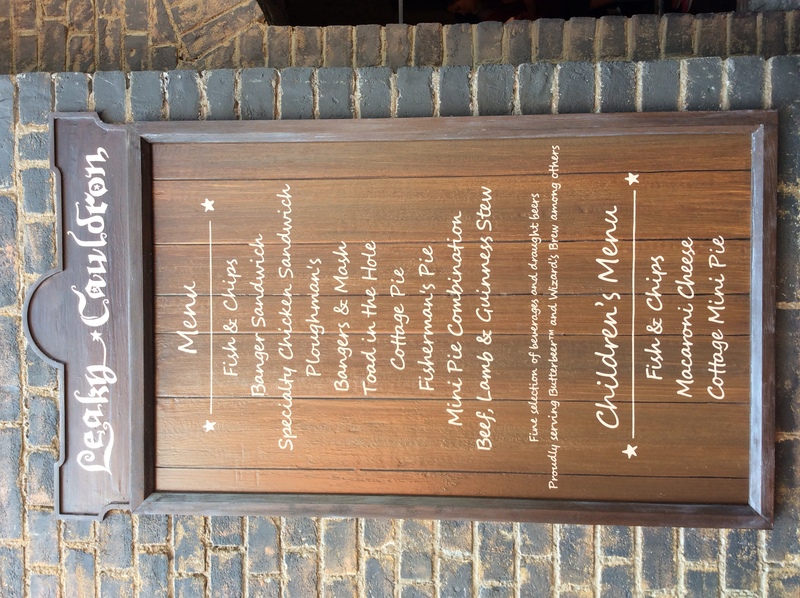 The thoughtful, hearty menus provide a fully immersive experience in Diagon Alley and Hogsmeade where guests can dress, shop and eat like a witch or wizard. The masterfully crafted experience leaves guests starry-eyed and hoping that their Hogwarts letter was just delayed. Ashley Martinez is a senior majoring in journalism and psychology, which have sharpened her people-watching skills. She has worked as a staff writer, copy editor, assistant editor and is now the Edge arts and entertainment editor at The Miami Hurricane. 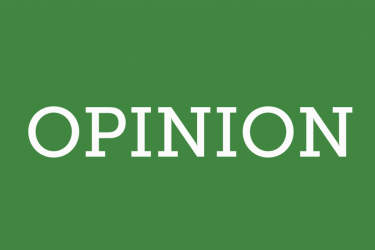 She serves as the president of UM's chapter of the Society of Professional Journalists. Her work has been featured in The Hurricane, Distraction Magazine, The Communique, Gables Home Page and The Miami Herald. When she's not working on a story, she loves going to the theatre and singing show tunes.